Our Chamber certifies documents for international trade verifying that goods in our members’ export shipments were produced or processed in a particular country. Certificates of Origin, Commercial Invoices, Packing Lists and Certificates of Free Sale are among the documents we process on a regular basis. Most export documents can be processed completely online via eCertify. Exporters and freight forwarders now have a seamless and streamlined electronic solution for export document processing. 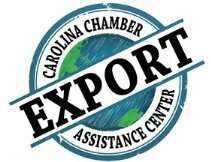 We've partnered with the Garner, Greater Raleigh and Haywood Chambers of Commerce to create the Carolina Chamber Export Assistance Center to bring the eCertify processing services to businesses across North Carolina. Visit ChamberExport.com to learn more and get started. If you're a member of the Chapel Hill-Carrboro Chamber of Commerce and ready to get started, click here or use the button below to register with eCertify. Contact Justin Simmons, vice president and chief of staff, at jsimmons@carolinachamber.org or (919) 357-9982 with questions.